Having been widely criticized for the brunt economic experience in demolition the ancient traditional markets in the Imo state. It is unbelievable to hear that the Governor Rochas Okorocha has demolished markets without building or providing alternative markets for the natives of the communities whose livelihood had been built around these traditional markets. in Owerri, traders in Imo State are currently weeping over continuous demolition of markets by the Governor Rochas Okorocha administration. 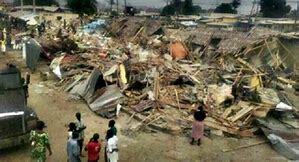 The latest is the demolition of Nwaoriubi market in Mbaitoli Local Government Area of the state. The demolition exercise has drawn widespread outcry, as some of the traders told newsmen, in Owerri, that they are currently passing through an unpleasant moment. Their reason was that, the government did not bother to provide an alternative place for them after their places of businesses had been demolished. Some pointed out that they were promised by some officials of the government that a place would be made available for them before the demolition of their shops, but that they were astonished, when they were asked to remove their wares without providing a place to keep their commodities. The traders said that when some of them tried to ask if the government had prepared another place for them, they were not given an answer. According to the traders, when the Deputy Governor, Prince Eze Madumere, in whose local government the demolition took place, visited the market, he was said to have pleaded with the traders to have patience and wait patiently for a future construction of a modern market in the area.